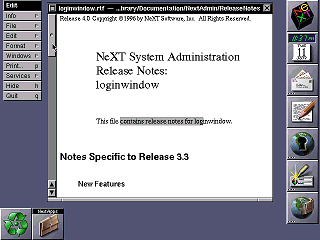 NeXTStep was the operating system created for the NeXT computer (a Motorola 68K based machine), and later ported to to the Intel x86/PC platform when NeXT shifted focus from being a hardware company to a software company. 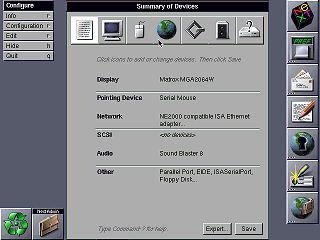 OPENSTEP is the descendant of NeXTStep, although technically "OPENSTEP" refers to a set of portable APIs based on those of NeXTStep that NeXT made available on Mach (The Unix-ish core that NeXTStep ran on), Windows NT, and Solaris. These screen shots are of OPENSTEP/Mach for x86. 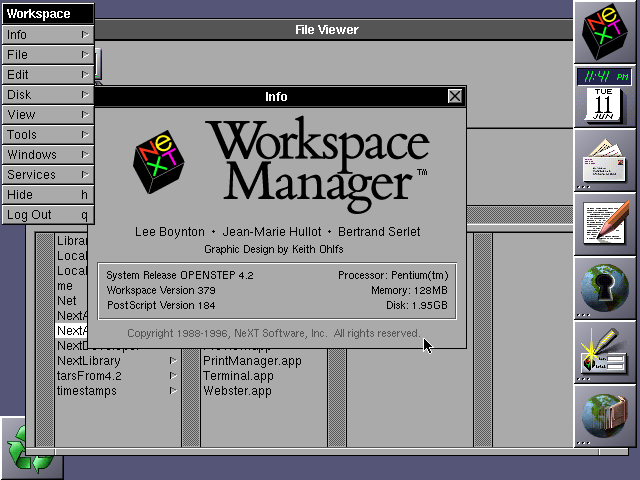 After logging in OPENSTEP starts the desktop and launches the Workspace Manager, a kind of file manager. Interestingly this is running on generic a pentium PC, rather than NeXT hardware. 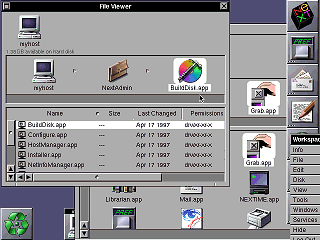 Like MacOS, OPENSTEP has a single menu for all running applications. Unlike MacOS the menu is in a draggable window that defaults to the upper left of the screen. When you click on a menu item it stays up, even if you click on something else on the screen (besides another menu item). 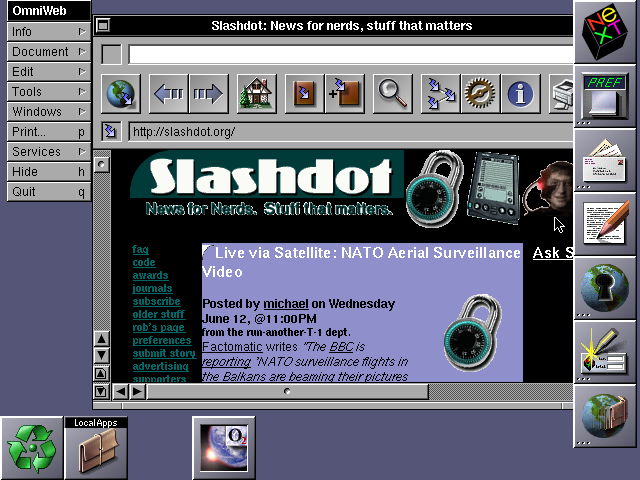 There is a standard toolbar that is always present and always visible on the right side of the screen. Items can be added and removed just by dragging their icon to or from the toolbar. 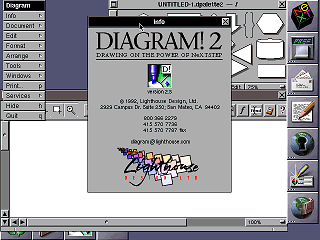 This user interface is designed for much higher resolutions (at least 1024*768), at the 640*480 resolution used for these screen shots the menu bar and toolbar always seem to be in the way. 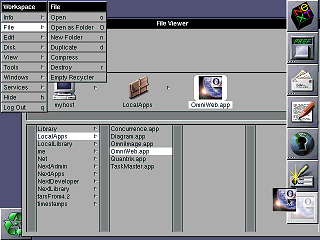 The file viewer, by default, displays folders as a series of columns. Selecting a folder opens it in the next column. 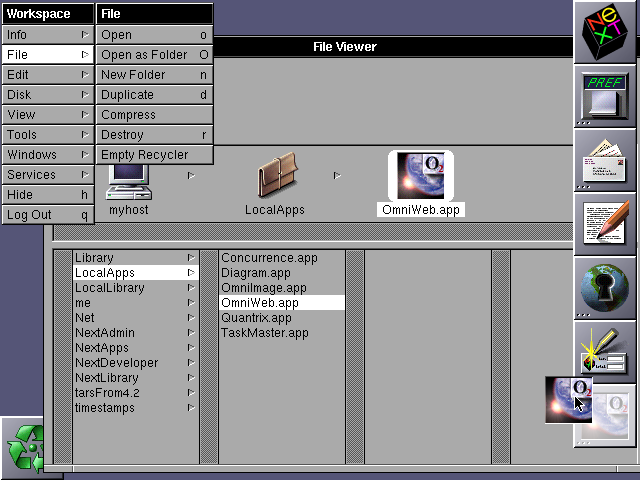 For deeper folders more columns are added and the horizontal scroll bar is used to move through all the columns. 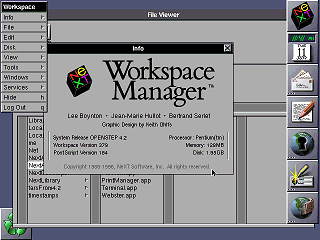 The workspace manager file viewer can display files as a set of columns (shown in previous screen shot), a detailed file list, or as icons. 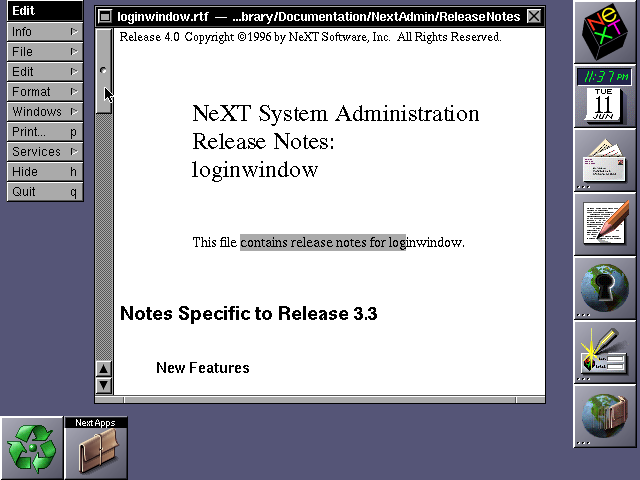 An interesting thing about the NeXTStep / OPENSTEP user interface is that the scroll bars are on the left. For left handed people this kind of makes more sense, and it is usually easier to keep your eye on the scroll bar while reading text. 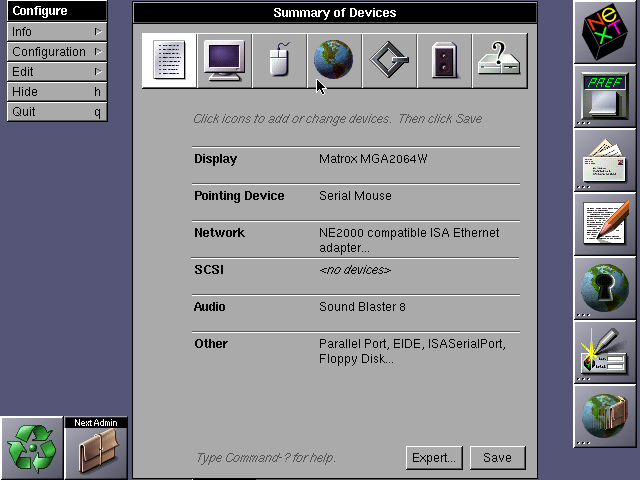 The configuration tool shows what hardware devices are installed and lets you make changes to their settings. 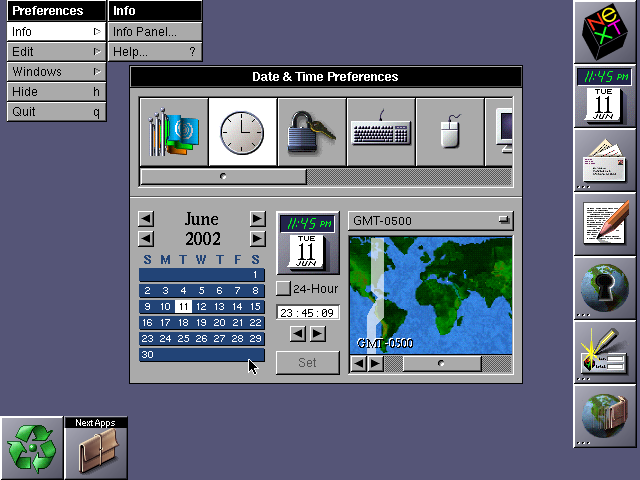 The preference panel contains the more common user settings for the desktop..
Underneath the hood OPENSTEP runs on top of a kind of Unix. 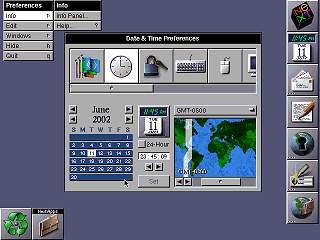 A example of a typical OPENSTEP application. 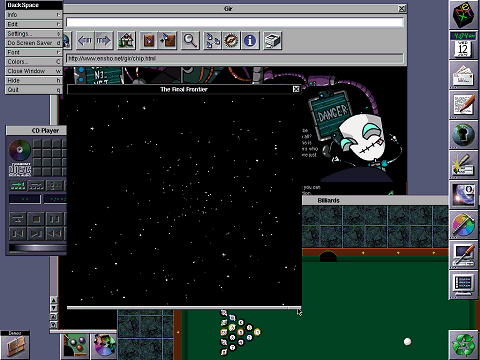 OPENSTEP includes the OmniWeb web browser. 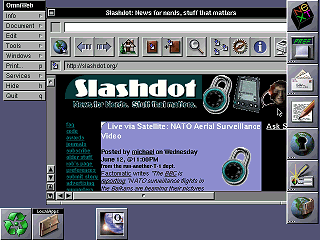 Here is the obligatory screen shot of yet another browser viewing Slashdot. 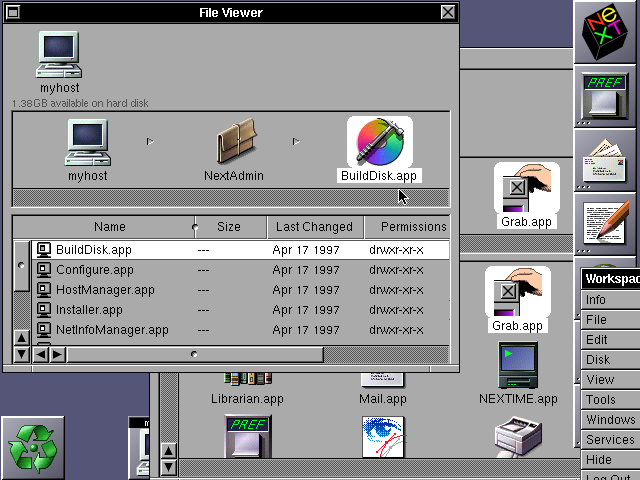 A larger screen shot of OPENSTEP running several additional demo applications.